Alison Sloggett – Drawing, Painting, Printing, Making. Just added some new items to my Etsy shop , but now I`m off to do some work in the garden ! search PrintPaintDrawMake on etsy or follow the link . This Saturday, the 23rd of February, at Hay on Wye, in Herefordshire I will be taking my work to this brand new print and illustration fair. Great for a day out, Hay is full of amazing second hand book stores and cafes. At the globe in hay , you will find lots of illustration and print fun, with lots of chances to pick up some art straight from the artists. Would be great if you came and said hi! Collagraph and letterpress print that I did for my family for Christmas. I made a very limited edition of 4 . I started with the idea of some ratties for my brother and his fiancée who have pet rats. But when it came to printing them as little individual cardboard plates, I thought they needed something else. Its the little things in life that do make it better, like family and friends. Little furry friends as well. Flowers, a sunny day or just a really good cup of tea when you are thirsty. So this print came to be, I spaced my rats out to leave a go for me to stamp some wood block letters into the space. Viscosity printing on laser etched woodblock ? Here I found a lasercut piece of mdf that was hanging around the workshop, and I thought I could use it to try a multi colour print. It was engraved by the laser so I could of just inked it with a roller and printed, or printed it like an intaglio print. As there were different levels to the engraving I thought I would blend the techniques. And at the time I thought I was doing viscosity printing but doing more research after, I did it slightly differently to the general way you apply ink in viscosity printing. I applied this layer of colour with a soft neoprene roller, the idea being the soft roller deposits the ink on some of the lower areas. When I rolled it over though, the orange covered most of the yellow I could see! Anyway I carried on with my next colour. Contrasting pale blue I thought would pop out, and the idea behind viscosity printing is the layering of colours without them blending, so this colour would be a good test of that thought I. Here is the plate before I rolled the blue on, which I made a stiff ink , by adding some chalk to, or magnesium carbonate works as well. When I rolled the blue on with a firm roller, it did not stick very easily , because I had got the order muddled up. A stiff ink wont stick to an oily ink , but oily will stick to stiff. Either way , into the relief press it went. I used damp paper and some felt blanket for a soft packing so the paper would be pressed into the blocks low places. Here is one of the prints I took. I like the way the ink had blended on the highest points, but that wasn’t what I was going for. But cutting myself some slack, the ply wood had a textured surface so it wouldn’t have been a solid colour whatever I did perhaps . It was an interesting block to ink up, and I learnt a lot about layering ink by doing it wrong and I’ve almost remembered the mantra stiff wont stick to oily… I think.. Thanks for reading, happy printmaking. Its been a while! Kitchen Litho 3 colour print. I didn’t realise it had been so long since I have blogged on here. I think I have been distracted but for good reasons, I have a new job at the Hereford college of arts, and have been doing a lot of printmaking, so all good ! Anyway, on my sketch I added registration marks in the corners after watching the creator of this process Emilie Aizier video https://youtu.be/IyRmvt7jgpU on YouTube on making a greeting card with two colours. The next step was to trace my design onto my tin foil, firstly I just drew through the tracing paper and then I went over those lines with soft 8B pencil. I made three plates, the first one was the pink of the flowers the second plate to be the green of the leaves and the third plate was all the outlines. All traced from the one drawing so hopefully they would all line up . This is a picture of the green plate, I used an oil pastel to block out the wide leaves and you can see the mark of the graphite pencil I used to draw the stem. I printed the pink of the flowers first, it being the lightest colour. I used my little table top press ( which I have posted a video on YouTube about ) but you could print by hand just with a spoon,it’s easier if the paper is damp. This is the plate after printing the final layer ,which are outlines, and you can see that because I didn’t wait for the print layers to dry between printing it’s has offset the ink onto the plate. I thought this would be more of an issue but this time I left it awhile in the cola and it made it much more resilient to ink sticking to it. If you have left it long enough in the cola it does clean off quite easily between inking up. I think this was potentially where I was going wrong on my previous attempts not letting it react enough with the cola. All the three plates together, I printed an edition of 12, these plates could have done more but I didn’t have time. And then… Just ripped the tin foil off the plastic backs and recycle! Please check out my you tube channel where I will be posting more how too videos on printmaking. This was me trying out printing drypoints on my press. 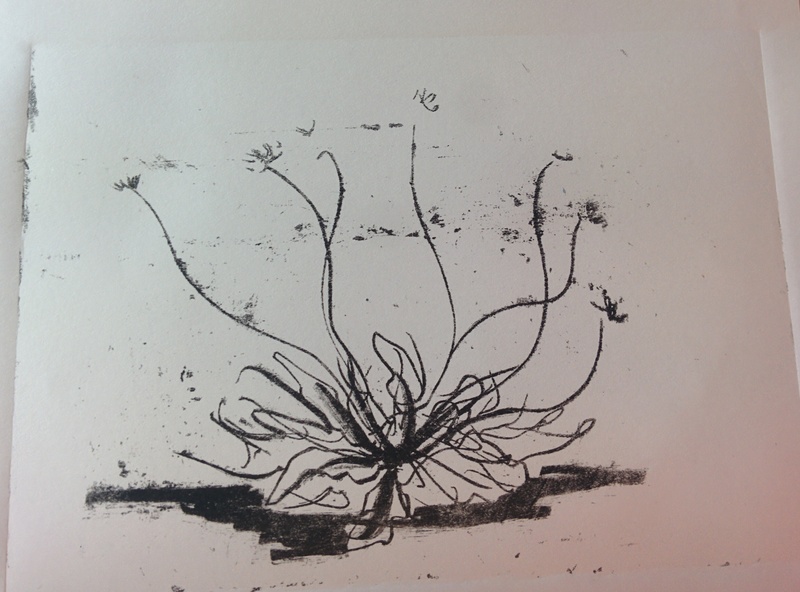 My drypoints are on perspex sheets , this one was of a sow thistle from the garden. I tried various combinations of leaving ink on the plate, printing with colour as I found some colour inks I thought I could use as intaglio ink ( they worked alright ), and adding a layer of chine colle. I was using rice paper for this , which I was adding ink to as well before passing through the press. Woops! Still some practice needed to get the pressure right on my little press. I was pushing it to its limits to try to get enough pressure to stick the chine colle properly. But this was tooo much pressure ! I’m pleased with all the colours and think the chine colle does add something. Hello, in a previous post I talked about how excitied I was to finally try Kitchen Litho as it is known. Here is my attempt at a how to on the process. It is not a very hard proccess at all , or even that long winded, and I am sure you could have a go and have loads of fun with it ! I originally found this process in a copy of Printmaking Today, back in 2012 written by a lady called Emilie Aizier-Brouard. You will be drawing on the mat side of the foil, BUT BE CAREFUL NOT TO TOUCH IT WITH YOUR BEAR HANDS ! Any hint of grease will show in your final print ( see my print below *sigh*), wear disposable gloves to be sure, I did not have any to hand…. Take your plate , I used an old bit of perspex to wrap my foil around. Cut the foil larger than your plate . then with mat side out ( make sureit is resting on something clean and grease free) wrap your sheet. I used clean( ish ) tissue paper to work on to help keep the plate grease free. I chose a picture that I thought would suit the sketchy line style that this printing process is best at. I kept to a simple selection of drawing materials, soft grapihte pencil ( 8B or 9B is best) and a graphite stick, again soft. You have to keep your hand from touching the suface as you draw. I like this as it keeps you from spending too long on the drawing . From my brief foray into this process the print quality is lovely but leans towards the informal. It would be hard to make it very clean and precise. I might be wrong and would love to know what other people are doing with the process. Pour your fresh cola into a plastic tub, enough to submerge your plate, and leave for 5 seconds and then go and rinse with clean water. Simple as that !! IF I had used other drawing tools, such as oil pastels, and was going to try to print in another colour other than black, I would now have to wash off the drawn marks after sensitizing the plate. To do this you pour a little oil ( such as rapeseed) on the plate and wipe it off quickly and gently with a soft cloth, you should see a phantom image apear . then wipe over with a clean damp sponge . If you left marks on the plate which left a residue, when you tried to ink it up it would clog. The phosphoric acid and gum arabic in the cola makes the areas that have not been drawn on , hydrophilic. This means water will sit in a film on the surface, but be repelled from the drawn areas, which will catch the ink from your roller. Senefelders Maxim – water repels grease. Ink rolled out , Im using intaglio ink, Raw Umber and bone black . Thick ink is important, but I’m not sure why! Before you roll your ink over, you need to make sure you wipe over your plate with your wet sponge, getting the right amount of water on the plate is important and you will just have to try it out and see what works for you. When you first ink up your plate it will need several passes of ink , wiping over with your sponge in between, and probably will not be as dense a print as the next one, as more ink gets built up on the plate. You can see here where in the top half of the image I touched it with my fingers it has picked up my finger prints, woops! If there are areas where ink is gathering and its not supposed to be , you can use a brush dipped in cola to clean off those areas . Printing using my mini printing press. 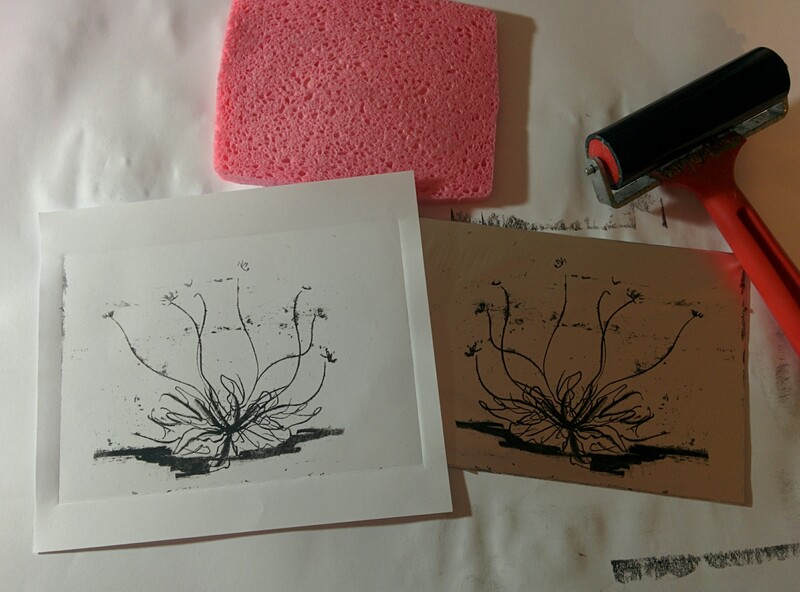 I tried both damp and non damp paper , using a spoon as a baren and the printing press to compare results. I will post the results in another entry. I got at least 10 Prints from this plate , and I think I could get more from it which is pretty good going. and having roller that is same size as plate. and being more careful touching the edges of my plate in the first place ! Hope you find this post useful and I would love to see what you make with it . ‘Kitchen lithography’. Its so easy ! You know those things that have been on your to do list since time began? Well one of mine was to have a go at kitchen litho, since I found an article on it at university. That was some time ago now! I finally had a go at it , and its amazing ! I will post a more in depth blog on it once i have practised it a bit more myself, but you can find information on it if you search kitchen lithography or something similar. It, compared to lithography in a studio , is a much faster , nontoxic way of getting drawing-like prints at home. Your print run would be small but it’s so exciting to be able to do it at home. The plate made of aluminium foil taped tightly and carefully to a piece of perspex, next to my first print from it. 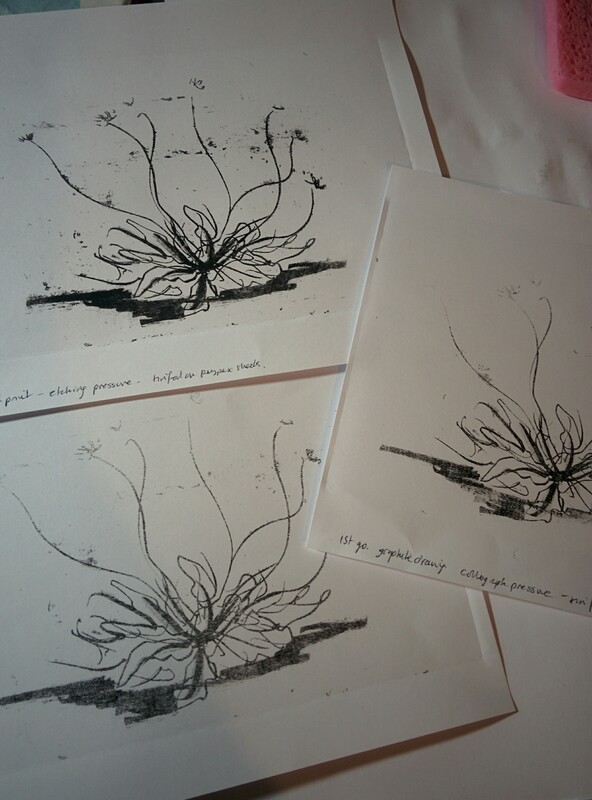 Three prints, it started getting ink on the rest of the plate after this not sure why, more experimenting needed. I drew onto the tin foil with soft graphite, 8b and above. This was a quick sketch of a Dandelion.